The overwhelming majority of women who undergo breast augmentation surgery do extremely well after surgery and enjoy the benefits of the surgery for many years. However, there are some circumstances where women who have undergone breast augmentation require additional corrective surgery. 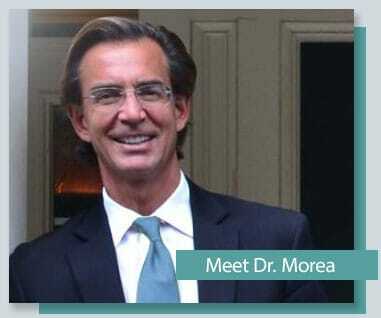 At the Morea Plastic Surgery Center in Raleigh, North Carolina, patients seek the expertise of Dr. Christopher Morea for corrective breast surgery or revisional breast surgery when they are unhappy with the appearance of their breasts following a cosmetic procedure. Prior to corrective breast augmentation surgery, Dr.Morea will talk with you about your cosmetic goals and evaluate your surgical results. If you determine that a revision procedure will correct the problems you are experiencing or bring you closer to your desired cosmetic results, Dr. Morea will give you an individualized plan for your revision surgery. Corrective or revisional breast surgery is performed in our Raleigh, North Carolina AAAASF accredited operating suite using either twilight anesthesia or general anesthesia. The length of the procedure may vary from one to three hours depending on the exact procedures that need to be performed. Recovery following corrective breast surgery is usually the same as the initial breast augmentation procedure. Most patients will return to work and resume normal activity within one to two weeks. However, strenuous physical activity and heavy lifting (over 10-15 pounds) should be avoided for four weeks. During your consultation for revisional or corrective breast surgery, you will meet personally with Dr. Morea. He will give you the opportunity to view before and after photos of previous patients. He will discuss the problems you are having as a result of your previous surgery and ask you many questions about the size, shape and individual look you desire. Dr. Morea will take the time to answer all of your questions and formulate an individual treatment plan to help you achieve the best cosmetic breast surgery results.